In a way the photo is deceptive. It shows acceleration, movement, muscles propelling the bicycle forward - but the speed is not excessive. The Copenhagener is merely using her high-heels to get the bike into motion off the light. She continued on at a sensible pace. I would guess it was around the Copenhagen average of 15 km/h. Interesting, in a way. 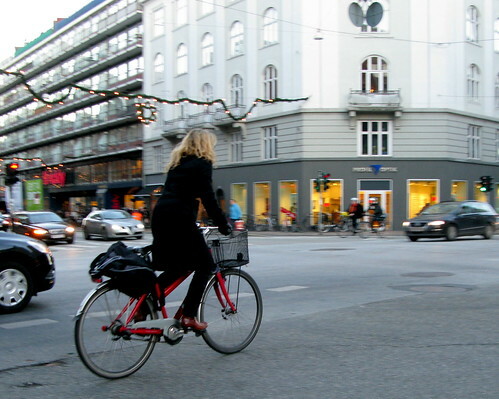 When 500,000 Copenhagners pedal around the city en masse each day the speed that they average is 15 km/h. This speed could never have been predicted by any expert but it is the speed that cyclists in an urban landscape have settles upon. It's a good speed. I agree, it's just about the perfect speed. What would the average for an automobile be? On my bicycle I rode approximately 8 miles or so in about 30-45 minutes. its about 15 or so by car at best. Thats about 15mph. a decent speed and I enjoyed myself! I find that each gear/bike has it's own kind of sweet spot in terms of the amount of force you use to pedal - which of course differs in different terrain - on steep terrain the sweet spot will happen at a slower speed, etc. It's right at the point where you are almost straining to push, but not quite. If you push any harder, you go faster, but your legs start to really feel it, if you slow down, it becomes hard to pedal. If you try to ride right in that sweet spot (of force, not of speed), you get a wonderful rhythm going and it feels great. i figure the best speed for cars is about 20 km/h. that way they are far less dangerous. Can you please tell me some hot shops in Copenhagen what I need to visit? Please contact me! the centre of the city is great for shops. the vesterbro neighbourhood - the street called Istedgade - is great, too.